I’m trying something new with my garden this year. I’m going to schedule the timing of my planting by the moon signs. At first, I thought the idea of planting by the moon signs was pure superstition, but the more I thought about it, the more I began to accept the idea that the moon’s phases might actually have some effect on the growth of the plants in my garden. If the moon’s gravitational pull can affect the tides of the ocean, why couldn’t it have an effect on the soil and the plants too? Planting by the moon signs isn’t exactly something that I’ve done copious amounts of research about, but I don’t feel like I really need to see any sort of scientific evidence or proof either to believe that it could help my plants to grow better. I think it’s one of those instances where we can learn a lot by looking back at history and the wisdom of tradition. Over the past few years, I’ve collected several 19th century almanacs printed between the years of 1824 to 1866. One thing that all of these almanacs have in common is a monthly calendar highlighting the moon phases and the astrological signs for each day of the month. In fact, the moon received just as much emphasis in these old almanacs as the other predictions of the weather did. 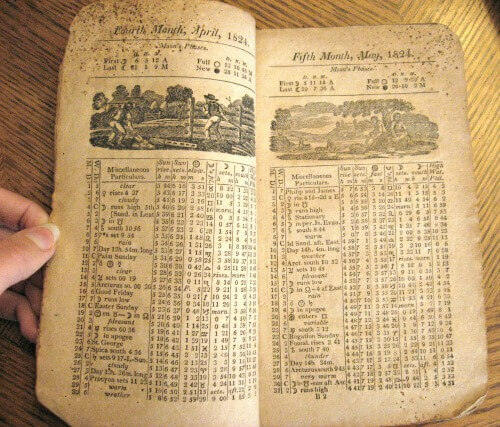 These almanacs were printed back in a time when people depended on the success of their crops for survival. Nowadays, many of us grow gardens mainly as a hobby. If our beans and tomatoes don’t do well, we can just go to the grocery store and buy some more. Since most of us don’t rely on our gardens for our main source of income and food, we tend to have a bit more of a casual attitude about them, but in past centuries, farmers and homesteaders put a lot of thought and planning into their planting and harvesting, using the moon signs as a way to try to improve their chances of having a successful crop. Old-Time Country Wisdom & Lore: 1000s of Traditional Skills for Simple Living. For anyone interested in history, homesteading, and simple living, this book is a fascinating compilation of just about every type of old-fashioned folklore you can think of. Basically, each phase of the moon is either an “increasing” or “waxing” phase or a “decreasing” or “waning” phase. The first and second quarter moons, or the phases between the new moon and the full moon, are increasing phases. The best vegetables to plant during these phases are those that grow above the ground. Good vegetables to plant in these phases include: asparagus, beans, broccoli, corn, cucumbers, lettuce, peas, pumpkins, squash, tomatoes, etc. The third and fourth quarter moons, or the phases between the full moon and another new moon are the decreasing phases. During these phases, it’s best to plant vegetables that grow beneath the ground. The third quarter is the better quarter for planting out of the two. The fourth quarter is best for turning the soil or pulling weeds. Good vegetables to plant in these phases include: carrots, onions, parsnips, potatoes, turnips, etc. Many old-time farmers also planted and harvested by the astrological signs. Barren signs, such as Aquarius, Gemini, and Leo, would have been considered ideal times for plowing and cultivating the soil, while fertile signs such as Cancer, Scorpio, and Pisces would have been considered the best times for planting seeds. While I’m going to try to follow the moon phases when planting my garden, I’m going to put the priority on planting during the proper weather. If there’s a chance of frost, I’m not going to plant my tomatoes just because it’s the last day before the moon phase changes. And if it’s cold and rainy or if it simply isn’t a convenient time for me to be planting, I’m not going to worry about following the moon phases exactly. After all, I’ve been able to grow vegetables for the past few years without paying the least bit of attention to the moon. Timing my planting by the moon phases is something that I hope will just give my garden that extra little boost to be as fruitful as possible. What’s your opinion on planting by the moon phases? Superstitious quackery or credible tradition? This post is shared with: Sunday School at Butter Believer, Clever Chicks Blog Hop at The Chicken Chick, Family Table Tuesday at The Polivka Family, Scratch Cookin’ Tuesday at Granny’s Vital Vittles, Party Wave Wednesday at Holistic Squid, Natural Living Link-Up at Jill’s Home Remedies, Frugal Days Sustainable Ways at Frugally Sustainable, Small Footprint Friday at Small Footprint Family. Spring E-Book Bundle – 90% off! Love this post, very interesting. Thank you for sharing with the Clever Chicks Blog Hop this week; I hope you’ll join us again! Those almanacs are so amazing. What a treasure. I have always found planting by moon to be enchanting. my parents broth grew up on farms. They swore by the Farmers Almanac and always planted according to the moon phases. 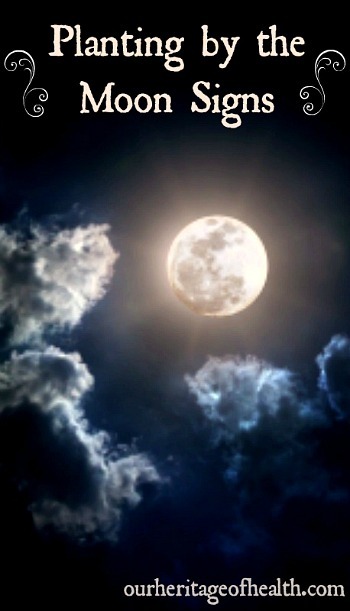 The moon is one of G-d’s greatest gifts to mankind. 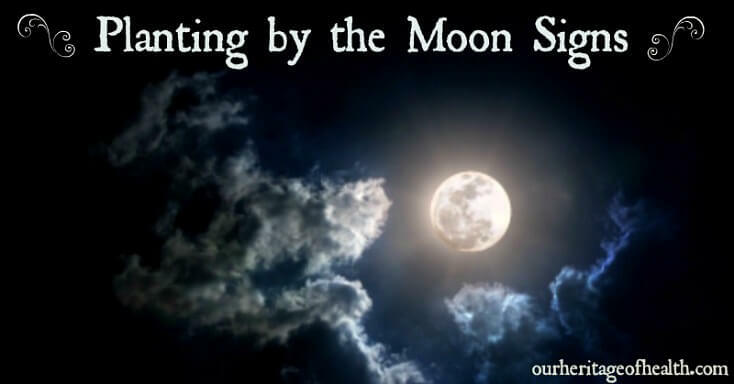 We plant transplant root and plant seeds by the moon…also prune for vigorous new growth or to deter growth(weeds ) Yes it works beautifully..
That’s a great idea to prune and weed along with the moon, too! My grandmother was the gardner in our family. She planted strictly by the sign of the moon and always had a bumper crop.